Rinse chicken and pat it dry. 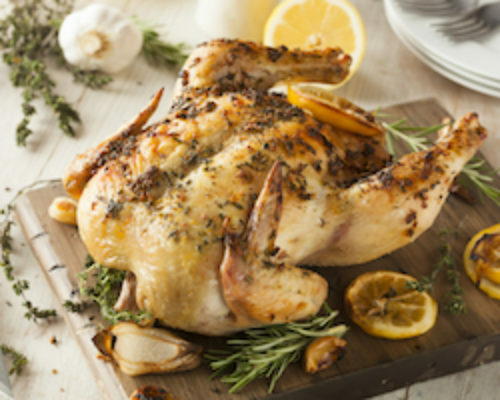 Stuff the open cavity of the bird with a peeled and quartered onion, half a lemon, some of your favorite herbs such as rosemary, thyme, garlic cloves, and/or sage (this is optional but will add great flavor to your chicken). Using room temperature butter or olive oil you can infuse herbs in either the butter or oil or use alone. Our Forrest Green Farm Poultry Seasoning and Himalayan Pink Salt are great toppings to season your chicken. Completely rub down all the skin of the chicken with the butter or olive oil mixture. You can even gently slit the skin from the breast and rub butter or oil under the skin. For added flavor top the buttered chicken with some extra salt and pepper. For lemony chicken, squeeze a little lemon juice on top of the chicken also. Place the chicken breast-side up on a roasting rack in a roasting pan. (If you don’t have a roasting rack it is ok to just place in a roasting pan). You can cook this as is or add some potatoes and carrots around the chicken. We usually layer the bottom with veggies and place the chicken on top of the veggies instead of a rack. Cook for only 15 minutes on 450 degrees and then lower the temperature to 350 degrees. Continuing baking for 60 to 90 minutes depending on the size of your bird. How do you know when it is done? Insert a thermometer into the thickest part of the thigh and it is ready when it reads 170 degrees and the skin is browned. Do not over cook as this is a pastured animal and can become dry if cooked too long. However, the meat should not be pink inside when you slice it either. If you do not have a meat thermometer, you can test by pulling the leg and it should be loose. When you think it is done cooking, remove the pan from the oven and let the bird rest for 15 minutes prior to slicing. Discard the contents from the cavity, carve and enjoy. Don’t throw out the bones from this chicken! You can make nutrient dense bone broth with the remaining carcass. You can make it right away or the bones can be frozen to make soup another day.